Despite living in the DC-metro area for three years now, it was not until Wednesday night of this week that I discovered one of Northern Virginia’s most delicious dining experiences. 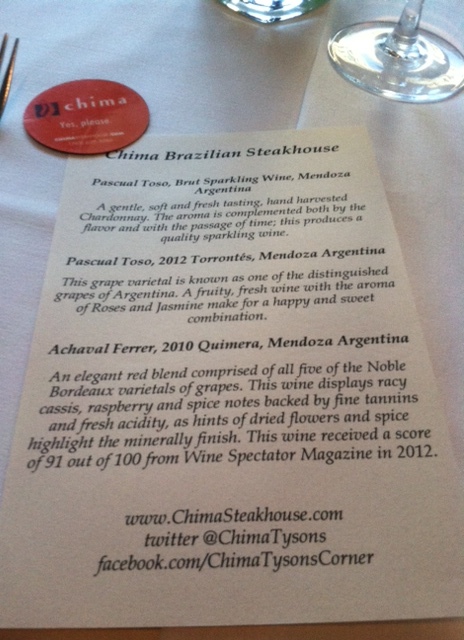 Chima Brazilian Steakhouse in Tysons Corner has to be one of the most savory and unique dining experiences you can have for a completely reasonable price, and it is now on my list of top restaurant recommendations in the Northern Virginia/DC area. If you are reading this post and thinking that savory and unique sound good to you, and you would like to try Chima but you are not located in the DC area, you can also find this restaurant in Charlotte, Philadelphia, and Fort Lauderdale. My Wednesday night experience at Chima in Tysons Corner started outside on the lovely patio area, tucked behind the building away from the busy roadway, and just off from the trendy, world-class bar/lounge area. Because of the nature of Tysons Corner, so much of the landscape is littered with stock office buildings and generic hotels. However, when you relax on the patio at Chima, you have a slight reprieve in the form of a beautiful water fountain view, a nice courtyard-style lawn, and the added bonus that you are far from the sounds of Route 7 or 495. Because Chima is a Brazilian Steakhouse, I was quickly offered one of Brazil’s most famous drinks: the Caipirinha. The Caipirinha is Brazil’s national cocktail made with cachca (sugar cane and hard liquor), sugar, and lime. For those of you out there who love a great Mojito (as I do, anytime), the Caipirinha is something you would most definitely enjoy. On a warm summer night, this is a perfect, refreshing cocktail to enjoy with friends, and the bartenders at Chima certainly know how to make it right. Chima’s bar menu of small appetizers is full of deep flavors and bold tastes. We were presented with beef Carpaccio, a tomato and mozzarella dish, and an artichoke salad on Brazilian bread dish, as well as several other rich choices. After drinks, and once we sat down at our table, we were greeted with several additional appetizers that included delectable cheese bread, beef croquettes, as well as a chance to visit the gourmet salad bar (which is absolutely to die for). Perhaps the most exciting part of the night, and the main reason you visit a restaurant such as Chima, is the presentation of the meat prepared by Gauchos. 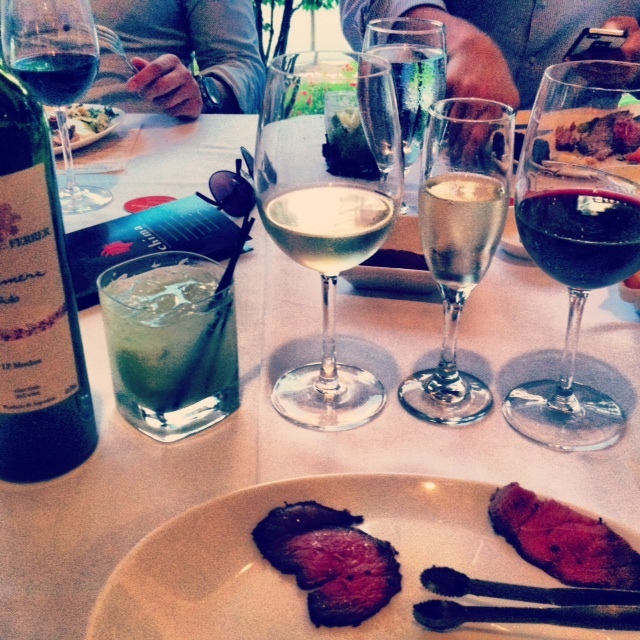 The service at Chima is known as “Rodizio” style. This means that the Gauchos bring the meat out to the table and cut slices of whichever kind you want, however you like it cooked. Meat choices include: the Picanha (Top Sirloin), flank steak, pork loin, lamb chops, leg of lamb, barbeque pork ribs, beef ribs, sausage, filet, filet wrapped in bacon, ribeye, boneless chicken, chicken wrapped in bacon, and even swordfish and salmon. Chima is definitely a meat-lovers paradise. But remember to pace yourself; it can be overwhelming for a first-timer. You will not regret at least trying a small piece of each type of meat. The quality is top-of-the-line. Not only does this restaurant have a wide selection of salad greens and juicy meats, but it also boasts an incredible wine menu, brought to your table on an interactive iPad. 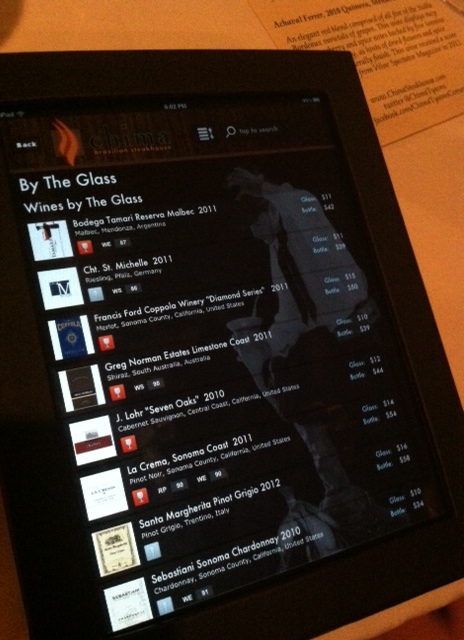 You can scroll through lists of whites, reds, and bubblies for your taste choice for the night. We had the opportunity to try one of each for the evening, and I would definitely recommend the wines that we enjoyed: Pascual Toso, Brut Sparkling Wine, Mendoza Argentina (bubbly); Pascual Toso, 2012 Torrontes, Mendoza Argentina (white); Achaval Ferrer, 2010 Quimera, Mendoza Argentina (red). Being the red drinker that I am, I can assure you that the Achaval Ferrer Quimera wine was absolutely divine, and perfect for pairing with all the red meat consumed throughout the night. Must try! If you aren’t already on the phone making a reservation for your next dinner date, let me entice you a little more with the dessert options, also brought to your table on an interactive iPad. I had the opportunity to try the more traditional Brazilian Walnut Cream and the Chocolate Toffee Cake with Kahlua. Let me just say that eating each one was like putting a little piece of heaven on your tongue. There is really no other way to describe it other than absolutely amazing. You will not be disappointed in the quality of sweets after your meal. So let’s get down to business. Chima offers regular dining as well as corporate meeting, or personal party event space. There are 2 VIP rooms, equipped with projectors, screens, and wireless Internet that can accommodate up to 120 guests. The restaurant itself can seat 300. This is the perfect place for your next company meeting, family birthday party, or special evening out. And if you would like to take the Chima menu for a test run, now is the perfect time! August 19-29, 2013 is Metropolitan Washington Restaurant Week. Chima will be offering a limited three-course tasting menu at a great price. Call to make a reservation today!